Archibald Coffman is one of my most intriguing ancestors. He was born near La Harpe, Illinois on the family farm. His parents were William Fowler Coffman and Elizabeth Wilson. He was a farmer and had a reputation for being very good with horses. He went "North to Alaska" to mine for gold and came back to California and worked at the Mare Island Naval Shipyard. 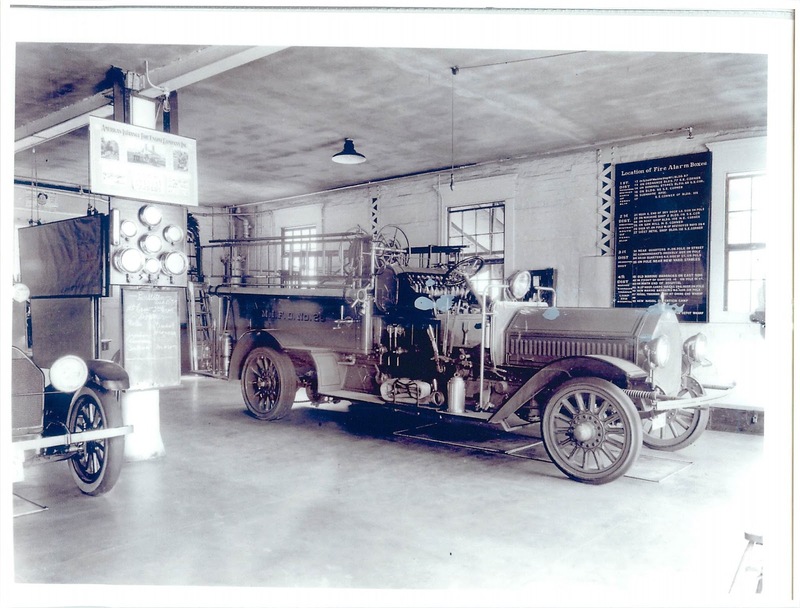 He was a teamster and a a fireman until he retired from federal service about 1919. Unfortunately, I have been unable to find a picture of him. 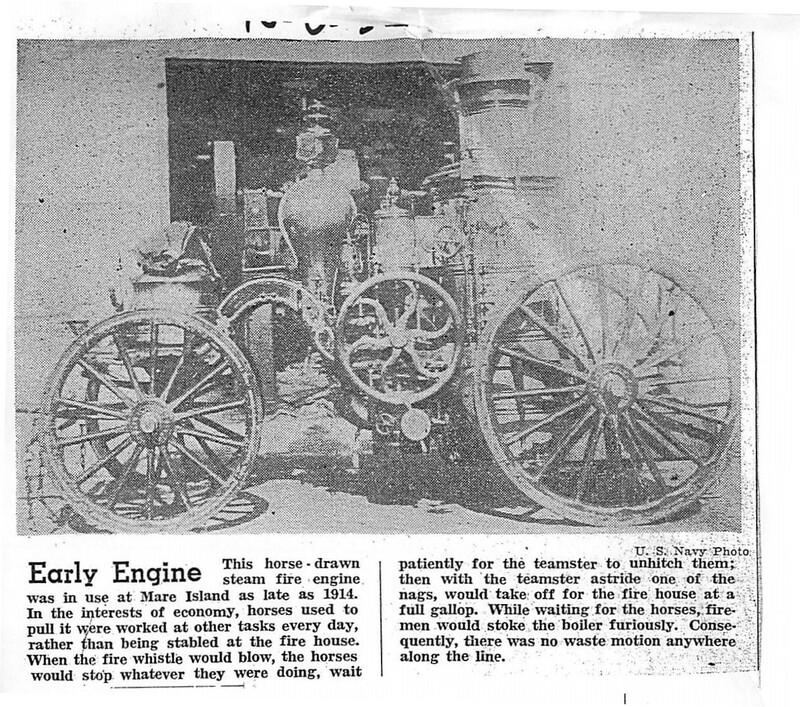 However, I have collected some very interesting documents, photos related to his work and stories about my 2nd great grandfather and I share them with you in this continuing series on my Coffman ancestors. 1. Archibald Wilson Coffman was born on 3 Jun 1850 in McDonough, Illinois to Elizabeth Wilson, age 34, and William Fowler Coffman, age 34. He was the eighth child among a family of nine children. He died on 18 Sep 1935 in Oakland, Alameda, California. He was buried on 21 Sep 1935 in Mountain View Cemetery, Oakland, Alameda, California. Archibald married Harriet Anne Ketcham daughter of James Henry Ketcham and Mary Lucinda Fairbanks on 10 Feb 1871 in , Hancock, Illinois. Harriet was born on 5 Feb 1853 in Manchester, Dearborn, Indiana. She died on 3 Sep 1938 in Oakland, Alameda, California. She was buried on 5 Oct 1938 in Mountain View Cem, Oakland, Alameda, California. 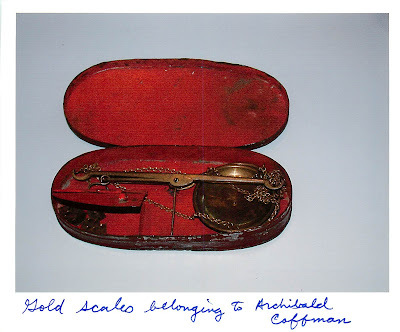 2 F i. Viola Nevada Coffman was born on 9 Oct 1871 in Illinois, USA. She died on 3 Apr 1966 in Castro Valley, Alameda, California, USA. She was buried on 6 Apr 1966 in Chapel of Memories, Oakland, Alameda, California. Viola married David Hughes son of David Yyalid Hughes and Jane Lloyd on 9 Oct 1894 in Oakland, Alameda, California, USA. David was born on 17 May 1868 in West Derby, Lancaster, England, Uk. He died on 30 Aug 1952 in Oakland, Alameda, California. He was buried in Chapel of Memories, Oakland, Alameda, California. 3 M ii. Otis Leslie Coffman was born on 19 Nov 1876 in , Hancock, Illinois. He died on 11 Jan 1958 in Oakland, Alameda, California. He was buried on 14 Jan 1958 in Mountain View Cem, Oakland, Alameda, California. Otis married Grace May King in maryland. Grace was born on 27 May 1885 in , , New York. She died on 25 May 1968 in Napa, Napa, California. She was buried in Mountain View Cem, Oakland, Alameda, California. 4 M iii. Ernest Ellsworth Coffman was born on 22 Jul 1879 in La Harpe, Hancock, Illinois. He died on 17 Sep 1934 in Oakland, Alameda, California. He was buried on 28 Sep 1934 in Mountain View Cem, Oakland, Alameda, California. !CENSUS: 1850 & 1860 with parents in McDonough County and Hancock County, Illinois. 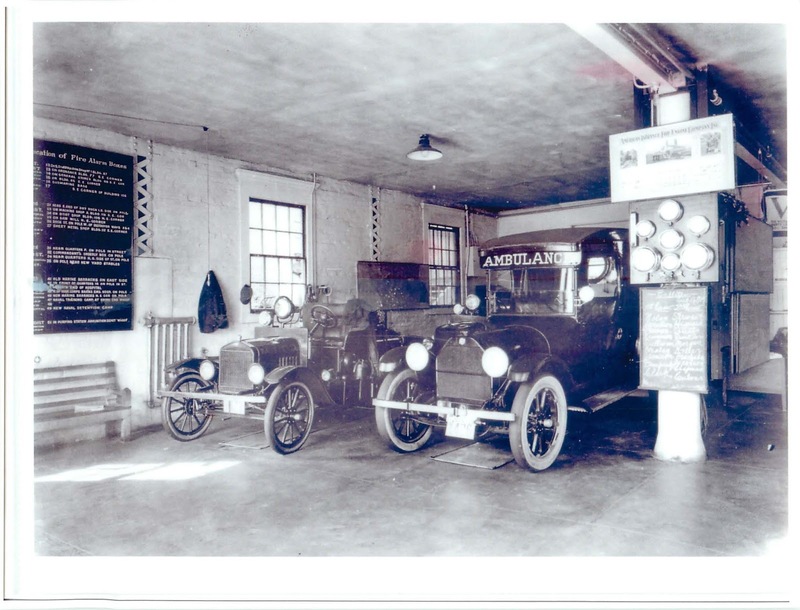 For some unknown reason, Archibald moved to Tehama County, California and purchased a farm of 279 acres. !LAND: Deed Dated May 5th 1885, Tehama County, California, from John Bates of Tehama County to A.W. Coffman of Sacramento County in consideration of sum of $4,464, Gold Coin does sell parcel of land described as the NW quarter and the West half of the North East quarter and other pieces of Section 21 Twp 26 North, Range 5 West M.D.B.M containing Two hundred and seventy nine acres. !LAND: Deed Dated April 12, 1887, Tehama County, California from Bank of Tehama County to A.W. Coffman for $1 the land described as the West half of the NW quarter of Section 21, Twp 26 North, Range 5 West, M.D.M. 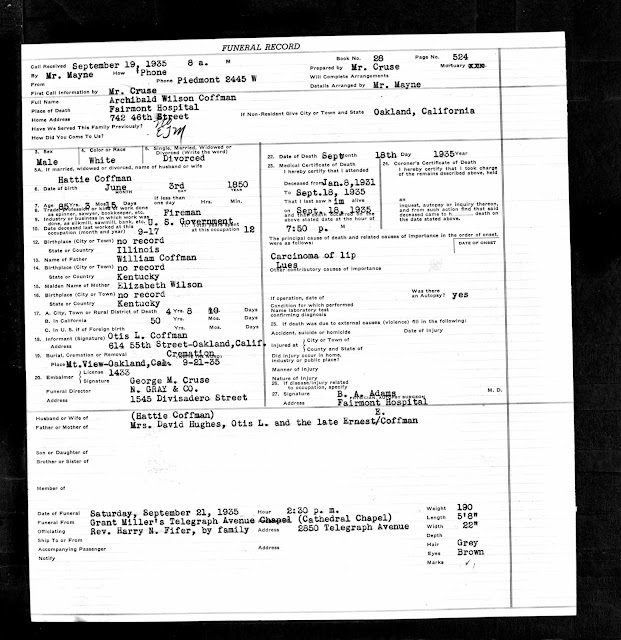 !RESIDENCE: 1888 Great Register of Voters of Tehama County; Archibald W. Coffman, age 36? (transcribed date); Birthplace: Illinois; Residence: South Red Bluff; Registration date: 23 Apr 1888; page 11. Also listed in South Red Bluff is Pelham Howard Coffman, on page 11. This information was gleaned from the California 1890 Index of the Great Register of Voters, 3 Vol. Set at Sacramento Root Cellar. 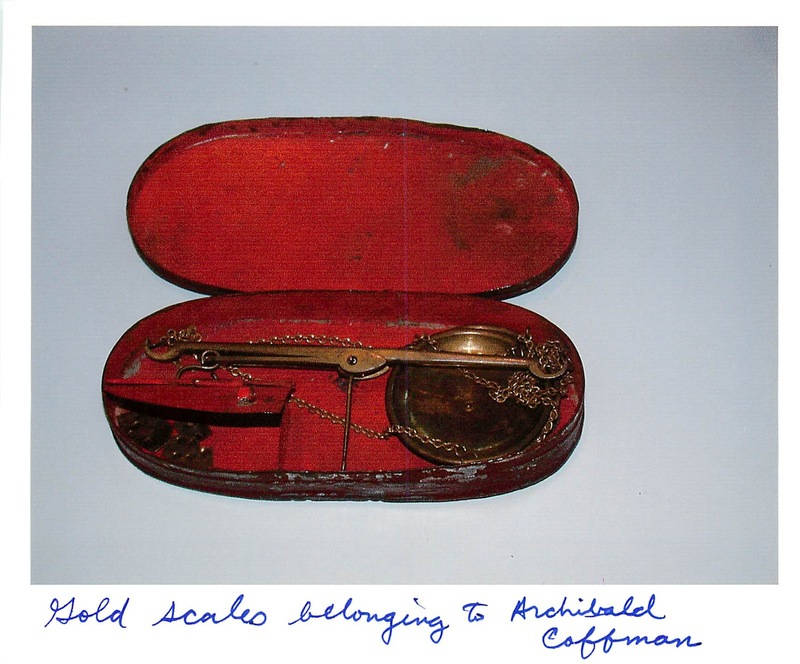 It appears that Archibald Coffman resided in Tehama County for nine or ten years and then moved to Oakland, California. There was another family of Coffmans in Tehama County that appear to have followed a similar pattern but it is unknown whether there was a relationship between the two families. !RESIDENCE: 1894-1899 Coffmans in Oakland‏ From: Jane Risser (jane.risser@sbcglobal.net) Sent: Sun 8/02/09 1:24 AM To: Nick Cimino (ncimino@hotmail.com) Hi Nick, Hope all is well with you. I was perusing some city directories recently and saw these. Thought I'd cc you in the off-chance you don't have these. "Archibald Coffman, great-grandfather. Born in Kentucky. Came to Illinois [sic] and married a farmer's daughter, my great-grandmother. He was a farmer, and a good one, but he had an irresistible desire to go places. All his life he greatly loved horses, and he knew a lot about them. After he married my great grandmother in Illinois, whose family had come there from the New England States, he moved to California to run a ranch. While he was in California the gold rush in the Yukon took place and he went there leaving his family in Tehama County. 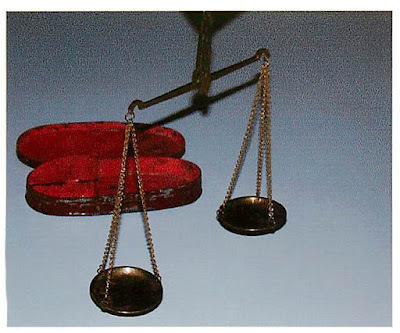 He stayed there about 3 years and these scales are the ones he used up there." I once looked up the dates for the Yukon Gold Rush to try to verify the time frame. The Klondike Gold Rush was in 1897-98. I think that must be what he was referring to. NOTES BY NICK CIMINO: Archibald Coffman was actually born in Illinois but his father was born in Kentucky and migrated to Illinois from Kentucky. From Gold Fields of Alaska (NAT&T Co., Chicago, 1897). !MIGRATION: 1898-1899: A. Coffman-Second-class passenger on steamer Excelsior, departing Seattle, 2/27/98 for Valdez, Seattle Post-Intelligencer, 2/28/98; NOTE: There is no birthplace information and with only a first initial it is difficult to confirm that this record applies to Archibald Coffman. 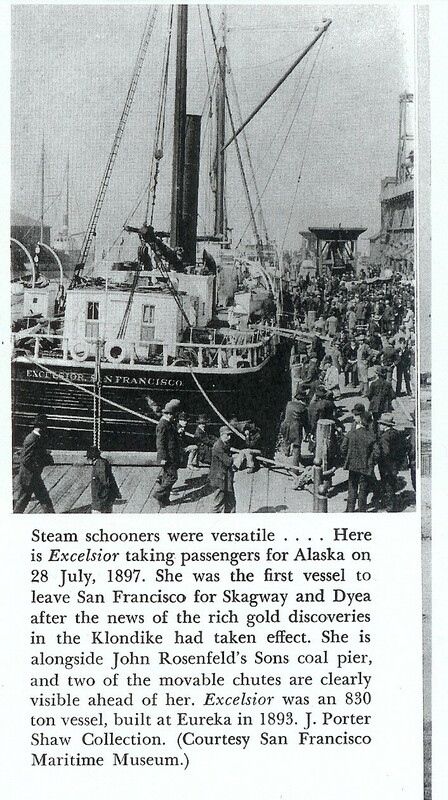 The Gold Rush begins: July 16-18, 1897 The Excelsior arrives in San Francisco with $400,000 in gold from the Klondike. 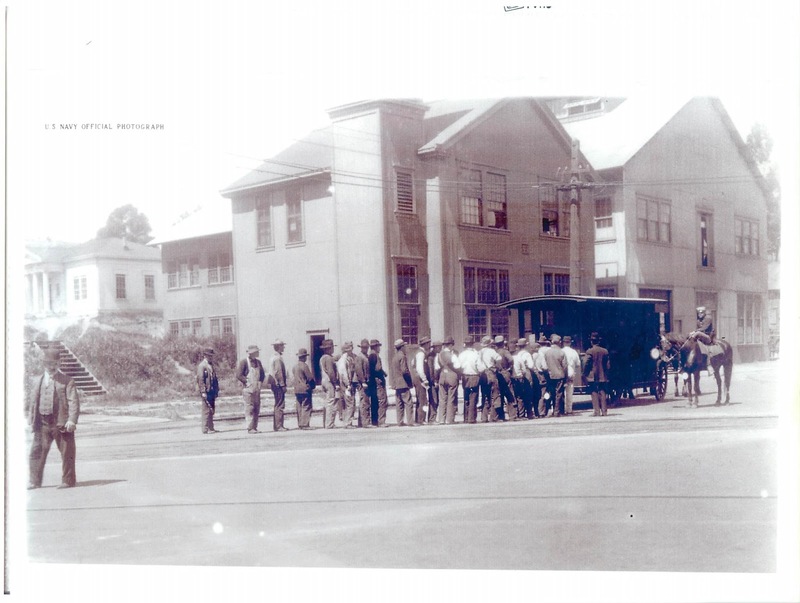 On July 18th, the Portland docks in Seattle with $700,000 in Klondike gold. Newspapers spread the word rapidly across the country. The gold rush begins. Although most stampeders would go to the Canadian Klondike, about 3,500-4,000 listened to the newspaper reports of even greater amounts of gold waiting to be discovered in Alaska's Copper River area and chose to pursue the Valdez Glacier trail to the Copper River gold fields. SOURCE: http://www.alaska.net/~awss/History.html This site provides excerpts of several books about the Valdez Gold Rush of 1898-99. !SOURCE TO SEARCH FURTHER: Passenger and crew lists of vessels arriving at Seattle, Washington, 1890-1921. (M1383) Film #1454937 Customs records of passenger manifests inbound, 1894-1909 : Port Townsend, Tacoma, and Seattle. ( M1484) Film # 1445995 Fortunately, almost all Immigrant Passenger Lists (post 1891) have been indexed. The exceptions are the Seattle lists, which were only found in the last twenty years or so, and some smaller ports that only had a handful of lists. Also in Nome at the same time is Jesse M. Coffman b-Mar 1868 in IL, home post office address was Sacramento, California. On the steamer Victory of Seattle there is a T. Coffman and on the steamer Sealandia (sp?) of San Francisco there is a W. Coffman. MANY STORIES OF DANGER AND DEATH. Seattle, June 26—The steamer Cleveland arrived from Cape Nome at 1:30 this morning with 15 passengers and a nominal amount of gold. She reports a severe storm at Nome on June 5, in which the schooner Alaskan, from San Francisco, was beached and is a total loss. Her passengers were saved by the revenue cutter Bear. She also has news of the wreck of the small sloop Gypsy in the same storm, and two of her crew were drowned. One was named Scotty Stewart. The Cleveland arrived at Nome on June 3, sailing nine days later. She was compelled, with all the other steamers, to stand out to sea till the gale moderated. She reports seeing safe at Nome the Corwin and her tow, the Catherine Sudden, Robert Dollar, Aloha, San Bias, Dora, Albion, Thrasher and Mary D. Hume. At Dutch Harbor —C. D.Lane, Charles Nelson, schooner Hera, transport Lawton, McCulloch, gunboat Wheeling, Dispatch, Perry, Homer, Edith, Sunol, Rube Cousins and Martha Tuff. The other vessels not reported are supposed to be beating their way through the ice to Nome. The Senator had a few plates dented by the ice and had to return to Dutch Harbori for repairs. The Robert Dollar arrived at DutchHarbor Just as the Cleveland was leaving for Seattle and will be due here in about a day. All the vessels at Nome are safe with the exception of the Alaskan, which ran on the beach and is a total loss with her 660 tons of cargo. Her passengers are safe. Her cargo went adrift and became the prey of beach people. Several lighters want ashore In the storm, but nothing was lost. The Catherine Sudden, which was in the tow of the Corwin, was in trouble on the way up, being dismasted and crushed slightly by ice. Clam Jumping was still in vogue when the Cleveland left. As a result of thisthere ware scores of personal encounters almost dally, but nothing more serious than'flsticuffs had resulted. The Second Steamer The steamer Cottage City arrived here today from Skaguway with $200,000 in dust and drafts and a number of passengers from Dawson. The latter left Dawson June 6, and confirm the reports of the finding of young Relfe's body near Mlnto. Among the interior passengers are George Avery and John Anderson. who are said to have $50,000 each with them. News of two sudden deaths in the interior is brought down by the steamer. Robert Hall of Victoria, of the Klondike corporation, dropped dead at White Horse. Dominick Stofolimo of Pennsylvania, a grade foreman, was killed at White Horse by a falling rock. The index says that he was registered there from 1900-1910. !RESIDENCE: 1901 Sacramento City Dir: Coffman A W, emp SP Co , r Fifth Av Hotel. !RESIDENCE: 1905 Oakland per father, William's obituary. !RESIDENCE: 1909 Oakland City Directory, Coffman Arch W., teamster, boarding at 798 46th. !RESIDENCE: The census and city directory listings below indicated that Archibald resided at Mare Island and at 330 Santa Clara in Vallejo. He did not register to vote there however. I checked the Voter Registers for Vallejo from 1904 to 1916 and did not find his name listed. He was also not registered in Oakland in 1910 or 1920. He was registered in 1924 at David and Viola's residence. He is listed as retired and as a Democrat. The rest of the family were Republican except Otis and Grace Coffman who were Democrats. !RESIDENCE: Ancestry.com has him registered to vote as follows: Solano County 1918-1928 The attached image lists him in Vallejo as a Teamster in Vallejo Precinct No. 2. The document image is from the California State Library accession No. 41521 Call No. 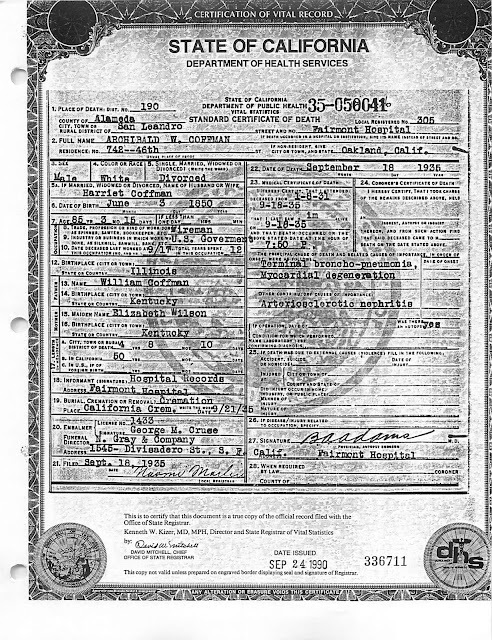 qc929.3 1920 and is entitled Index of Registration, Solano County, 1920. Coffman Archibald partner 53 B-IL profession= teamster at Navy Yard out of work 8 months Enumerated with David H. VanBuskirk who may be the husband of a cousin. !RESIDENCE-OCCUPATION: 1915 Vallejo, Benicia, Fairfield & Suisun Directory; Coffman, AW, teamster Navy Yd. 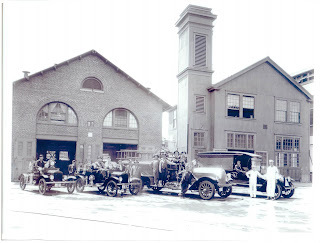 !CENSUS:1920 Solano County, CA; VOL 126, ED 210, SH 17, LN 58;NA Soundex film# T1261-35; profession= teamster at Navy Yard; Roomer at 330 Santa Clara, Vallejo; marital status=single;parents Born-KY !LAND: Date unknown. Reported by my grandmother to have owned a rooming house in lower part of Oakland near 6th and over towards the bay but was not able to find his name in the land record index at the Alameda County courthouse. !RESIDENCE: 1921 Oakland City Directory; Coffman, Archibald W. r. 742 46th; this was the residence of his daughter Viola and her husband David Hughes. !RESIDENCE: 1920-1935: Oakland per remembrance of Otis Coffman below. !BIOGRAPHY: Family narrative by Otis (Bud) Coffman, Felton, CA, Jan 1992; "What little I know of my Coffman grandparents seems almost inconsequential. They along with my Uncle Ernest and Aunt Viola and my father and mother all lived in North Oakland, California within a radius of three miles from my boyhood until their demise. I have heard tell that grandfather worked as a fireman for the city of Vallejo, California. He took me to my first circus on San Pablo Ave., Oakland next to the Oakland Baseball team park when I was a young teenager. My grandfather lived with his daughter, Viola for several years and a short time with my parents." !BIOGRAPHY: Interview with Elaine Coffman Kelly by Nick Cimino, 4 Nov 1989 My grandfather owned a rooming house in Oakland. My dad lived there after after he divorced my mother. I remember that he chewed tobacco and he had a spittoon and he was spitting the brown juice into it. I used to take the street car down there. I do not remember if I ever stayed the night. 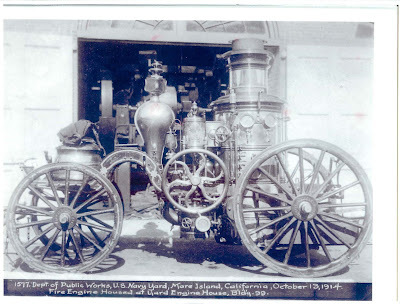 He worked for the Mare Island Fire Department. They had horses. He bought this property down in the lower part of Oakland about 6th or 7th and over from Grove. It was walking distance because I remember walking down there to see my dad before I was married about 1925. My dad and uncle had the tire company about that time. !BIOGRAPHY: Interview with Vivian Coffman McGrath by Nick Cimino, 10 Nov 1989 Grandpa Coffman lived at Aunt Viola's house for a time. 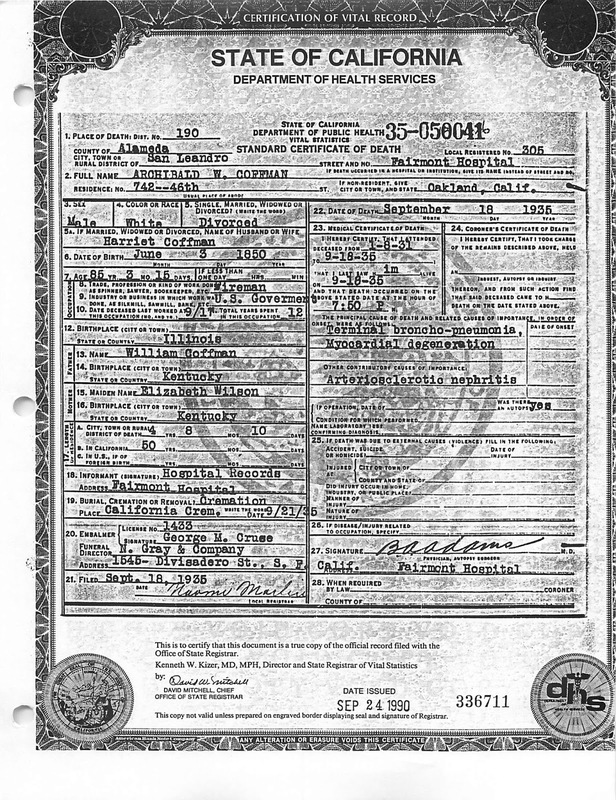 !DEATH:1935 CA Death Certificate #35-050041; Copy issued 24 Sep 1990 #336711 Mountain View Cemetery records transcribed 11 Nov 1989; Native: Illinois; Age at death: 85 yrs. 3 mos. 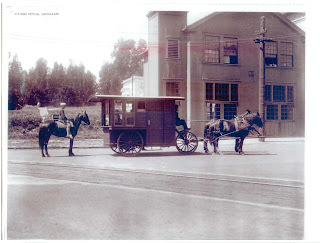 15 days; Mortuary: N. Gray & Co. San Francisco; Place of death: Fairmont Hospital; Cause of death: Carcinoma of lip. !BURIAL: 1935 Mountain View Columbarium, Section 107, Niche 5D, Tier 6. Date of inurnment 9 Dec 1935. !OBITUARY: 1935 Oakland Tribune September 20, 1935 Vital Statistics- Deaths; COFFMAN- In Oakland, September 19, 1935. Archibald Wilson Coffman, father of Mrs. David Hughes, Otis L. and the late Ernest E. Coffman. Friends are invited to attend the funeral service at 2:30 p.m. Saturday at the Cathedral Chapel, 2850 Telegraph Avenue. My grandfather, Engel True Mayne was a funeral director for N. Gray & Co.
and arranged the funeral for his wife's grandfather. There is a conflict in the cause of death from the death certificate and the funeral home record. It appears that he had a carcinoma of the lip perhaps caused by his chewing tobacco habit. The pneumonia may have actually been the cause of death according to the medical certification on the death certificate.